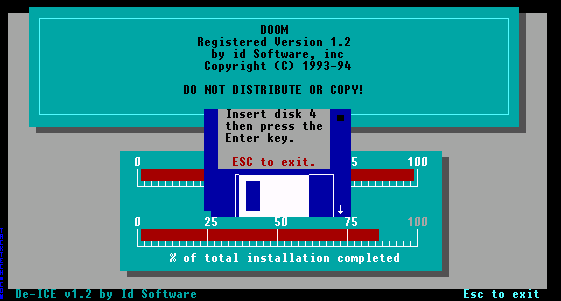 Installing Doom (floppy diskette version) (Doom) - TACKtech Corp. This article will show you how to install DOOM (floppy diskette version). We are using v1.2 in this example. 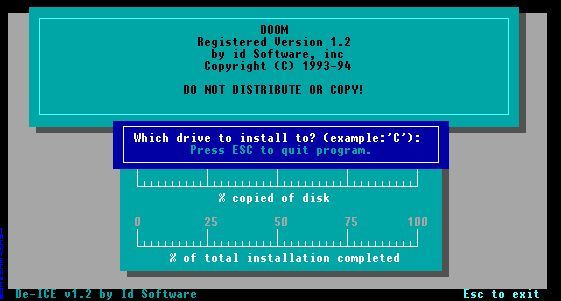 Other versions of DOOM install similarly. Insert Disk 1 into your floppy drive. Enter the drive letter to install to. We are using C, the default, in this example. Note: If you have another partition to install to type that letter. Just be sure to remember what drive you choose because a Shortcut Icon will not be created by most DOS installers. Type on the directory (folder) you would like to install to. We are installing to the default directory. Notes: Use the backspace and arrow keys to navigate. You are not allowed to create sub directories. 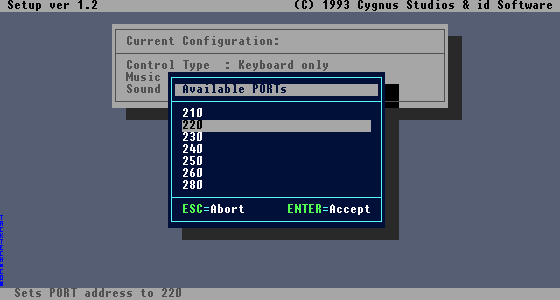 Again, remember what you choose because a Shortcut Icon will not be created by most DOS installers. If you selected a directory (folder) that does not exist you will be prompted to confirm you want to create it. Press the Y key to continue. 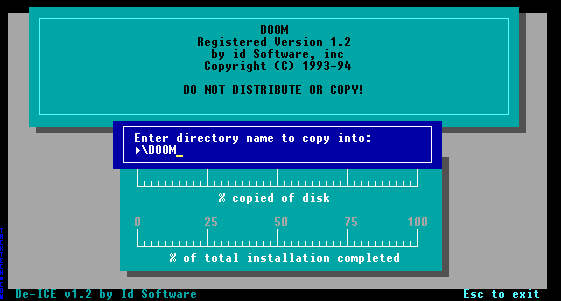 After the data from Disk 1 has been copied, you will be prompted for the next disk. Wait while the files are extracted. Note: If you are a Keyboard Junkie select Keyboard only. Back in the day, people who used the Keyboard were considered more skilled. Now, use of mouse is expected. If you are playing a DeathMatch use a Mmouse unless you are daring. You always can tell who is using a Mouse. 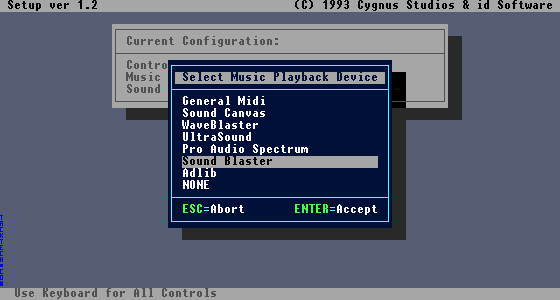 Select the Music Playback Device. Note: Most sound cards this days are Sound Blaster compatible; however, with newer sound cards and Windows General Midi works and sound better. If you are using Windows NT or Windows 2000 choose NONE since DOS audio playback is forbidden. Note: Try the default if you do not know the correct PORT. 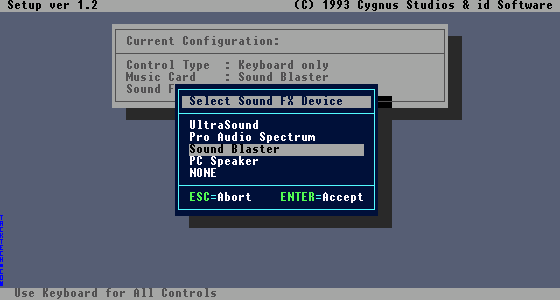 Select the Sound FX Device. 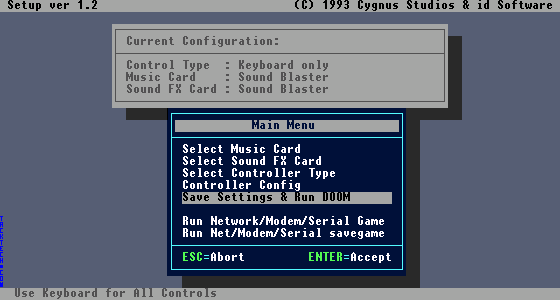 Select the Sound FX PORT. Select the Sound FX IRQ. Select the Sound FX DMA Channel. 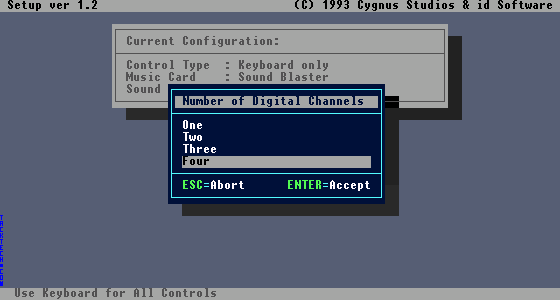 Select the Number of Digital Channels. Note: Use Four unless your PC is a fossil. 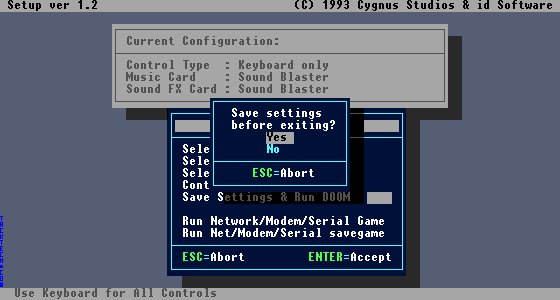 Press the ESC key, if your version is not v1.9 or you do not wish to play at this time. Otherwise, press the Enter key. 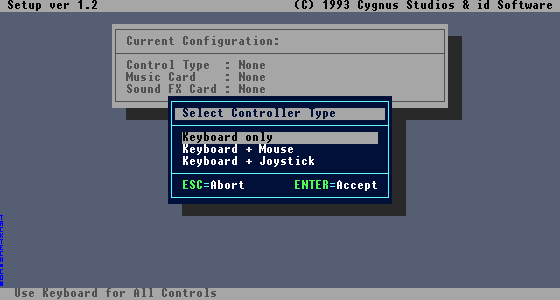 The remaining steps are only for those of you who pressed the ESC key on the previous step. 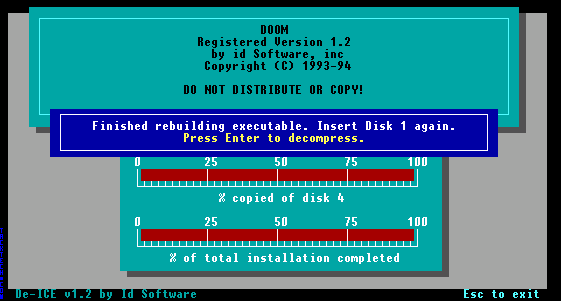 Get the Doom Registered/Shareware patches to upgrade to v1.9.